Pigmentation in the form of sun damage, sun spots, and freckles can often be easily treated by a combination of skin care products, IPL/BBL, laser and chemical peels. Hormonal pigmentation (melasma) can be much more difficult to treat and can often be made to look worse with some treatments. The condition can be debilitating and affect self esteem and confidence. Dermamelan is a new and safer alternative to other treatment modalities and can be used effectively in ALL types of pigmentation, restoring the skin to its natural condition with even tone and brightness. Dermamelan is the worlds number one treatment for pigmentation. Dermalelan is a topical treatment used to treat all types of pigmentation, from sun spots and freckles to stubborn hormonal melasma which is difficult to treat with other modalities. As a topical lightening and brightening procedure, Dermamelan is safe to use on all skin types including Asian and Indian skins which often have significant pigmentation that cannot be treated safety with other methods. It can be used in patients who’s pigmentation has not responded to other types of treatments. Dermamelan is a MEDICAL depigmentation treatment and should only be used under the supervision of a doctor. Other clinics offer Cosmelan which is the weaker alternative to the treatment. At Youth Lab we only offer Dermamelan with strict doctor’s supervision. Following your consultation with our doctor to establish your treatment plan you will see our dermal clinician for the Dermamelan treatment. The treatment consists of an inclinic phase and a home care phase. After cleansing the skin the Dermamelan mask will be applied which feels like a heavy moisturizer. The solution is adjusted according to the patients concerns and skin type. The mask needs to be left on for 8-10 hours depending on the severity of your pigmentation. It is best to come into the clinic in the morning so you can relax at home with the mask on during the day. It is best NOT to sleep with it on. You can then wash off the mask and at this time may feel some tingling and stinging. Your skin will feel tight, red and a bit swollen. Over the coming days the peeling effect will start. The at home phase is the maintenance products that must be used following the in clinic application. The majority of patients experience a significant improvement after just one treatment. However longer term results are dependent on strict home care (as provided as part of the treatment) as well as continued avoidance of sun exposure, triggers for the melasma and daily use of broad spectrum SPF. Many find a repeat treatment at 6 months gives the most optimal results however annual maintenance treatments are also effective. It is important to remember that hormonal pigmentation (melasma) is a chronic condition with no cure. Dermamelan can control the condition provided triggers and exacerbating factors are avoided by the patient. Once the mask has been removed at home you may simply go about your normal activities at home. It may be necessary to take time off work and not plan any social events in the few days following the Dermamelan treatment. Your skin will begin to peel and flake off and may feel very tight and dry. The dryness is generally more evident around the mouth and eyes. Despite the feeling of discomfort, tightness and visible peeling skin it is extremely important not to pick or peel at your skin as this may damage the healthy new skin underneath. Strict adherence to the home maintenance program at this time is essential. All the necessary steps will be explained by our dermal clinicians and we are always happy to review patients during their Dermamelan journey. The results of the treatment become evident by about 10-14 days with visibly clearer and brighter skin. Ongoing improvement in the skin can be seen over the next three months. + IS DERMAMELAN DEPIGMENTATION SAFE? Dermamelan is a very safe treatment. 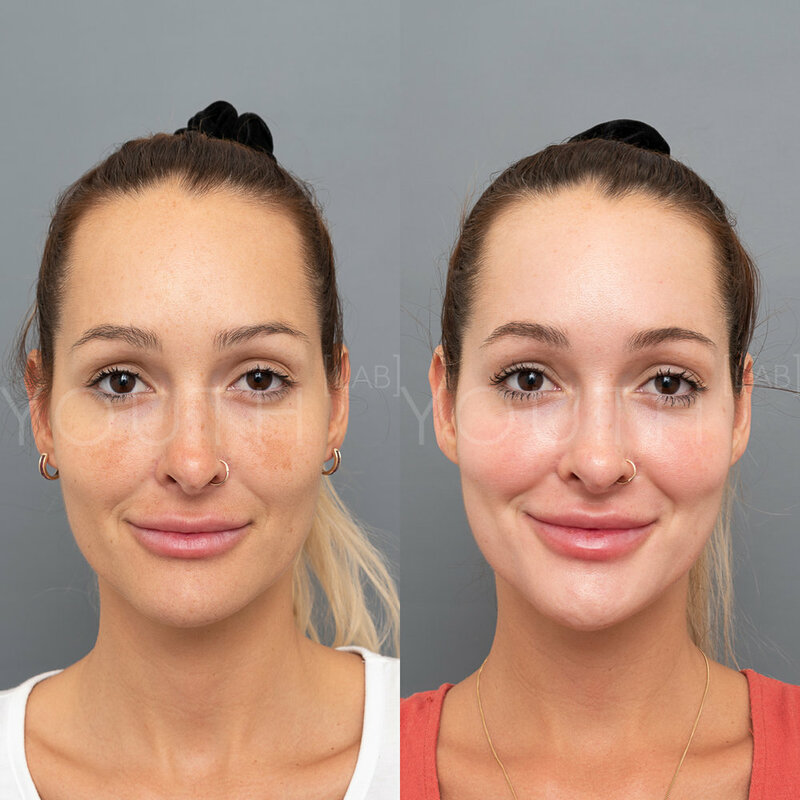 There are certain situations where the treatment cannot be performed however this will be discussed at length during your consultation with our cosmetic doctors and dermal clinicians. Dermamelan cannot be performed if you are pregnant or breastfeeding, have taken a course of prescription acne medications in the last 12 months, have any active infection or open wounds, have active herpes simplex (cold sores,), have been sunburnt recently, have allergies to aspirin or Salicylates, are prone to keloid scarring or have had any cosmetic treatment including laser/IPL/peels/injectables in the past 2 weeks. We also ask patients to avoid any active ingredients in their skin care for the week prior to the treatment. It is important that the full treatment regime be completed in its entirety and no other treatments may be performed during the treatment regime. To view our up to date pricing please visit our Dermal Pricing page and look up under the Dermamelan Treatment section.